Japan's largest coral reef system has become the latest casualty in a long series of coral bleaching events around the world. More than 90 percent of coral in the Sekisei Lagoon, located in the Okinawa prefecture, has bleached, according to a new survey just released by Japan's Ministry of the Environment. And a whopping 70 percent of the reef has died. It's the worst news yet in a bleaching event that's been going on for months now. A previous survey, conducted in September and October 2016, found that 56.7 percent of the reef had died, while 97 percent total had bleached. An even earlier survey, conducted in July and August, found that 89.6 percent of the reef had bleached, but only 5.4 percent had died. The findings follow a summer marked by unusually high regional ocean temperatures, a primary cause of coral bleaching around the world. Between June and August 2016, water temperatures in the area hovered above 30 degrees Celsius, or 86 degrees Fahrenheit, said Mari Yamazaki, a member of the Environment Ministry's Nature Conservation Bureau, in an email to The Washington Post. Japan's Yomiuri Shimbun newspaper reports that average summer sea surface temperatures for the region are typically around 29 degrees Celsius. According to the Japan Meteorological Agency, sea surface temperatures around Japan have risen an average of 1.07 degrees Celsius in the past 100 years, which is more than twice the global average warming rate. Japan isn't the only nation whose corals are suffering. 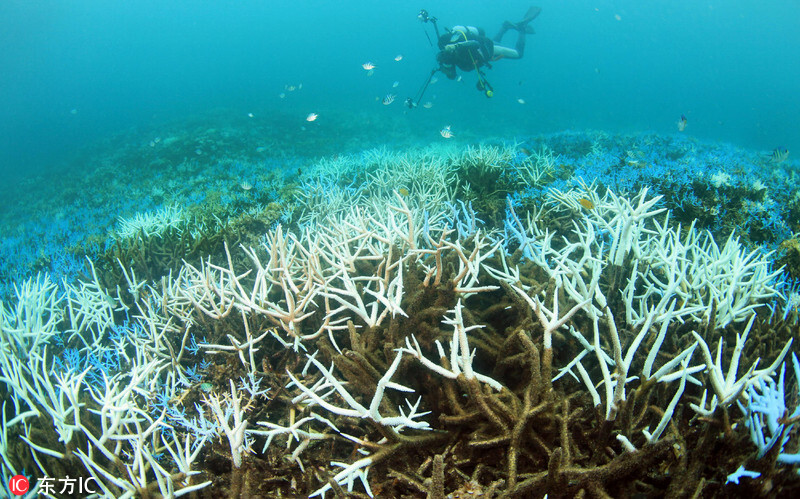 A global bleaching event has been ravaging coral reefs all over the world for several years. Scientists believe a long-term pattern of rising ocean temperatures is largely to blame, although the damage was exacerbated in many places by the effects of an unusually severe El Niño event beginning in 2015. Australia's iconic Great Barrier Reef is among the most famous of the casualties. Just a few months ago, researchers announced devastating losses in the northern part of the reef, with up to two-thirds of the corals having died in some areas. And scientists have made similarly grim discoveries in many other reefs around the world, from the United States and the Caribbean to the Western Pacific.